But while Kaepernick’s stand against injustice appears to have cost him his NFL career, and Reid has inexplicably (and blatantly) gone unsigned on this year’s free agent market — both players have filed grievances against the NFL, accusing team owners of collusion — Jenkins hasn’t gone anywhere. Entering his 10th pro season, Jenkins has been ranked No. 96 on the NFL Network’s annual top-100 list that is decided by NFL players. He was No. 90 on the list last year. Jenkins made 76 tackles last season, with one sack. He intercepted two passes, broke up eight passes, recovered one fumble and forced one fumble. In the playoffs, he led an Eagles defense that held NFC opponents Atlanta and Minnesota to a combined 17 points in two games. Then in Super Bowl LII, Jenkins’ knockout hit on Patriots wide receiver Brandin Cooks was one of the defensive highlights of Philadelphia’s 41-33 championship victory. In the Eagles DB tradition of Brian Dawkins, Jenkins is a fierce hitter who blends a linebacker’s physicality with a traditional DB’s ball-hawking skills. Last season he was one of two safeties in the league (Minnesota’s Harrison Smith being the other) to rack up at least five tackles for losses and eight pass breakups. 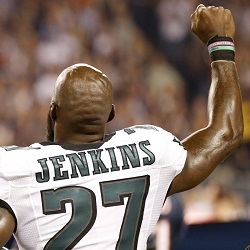 With Kaepernick out of football last season, Jenkins stepped up and became something of a spokesman for active NFL players who were protesting during the anthem. He is respected all around the league not just for his stellar play on the field but his activism and community work off the field. Now with a second Super Bowl title on his resume (he earned his first with the New Orleans Saints) and continuing to collect accolades, Jenkins is starting to put himself in a future Hall of Fame discussion.